Who is responsible for the maintenance and repairs of a specific area depends on the nature of the property. How do I find out what the nature of an area is? You need to look at the scheme’s sectional plan (the trustees and managing agent should have a copy, or you can try our bank of free online sectional plans or you can get a copy from your local Deeds Registry). The sectional plan will show what areas are sections, the common property and any registered exclusive use areas. You need to look at the scheme’s rules (the trustees or managing agent should have a copy, or you can get a copy from your local Deeds Registry). Rule-based exclusive use areas will be detailed in the rules of the scheme and there should be a sketch plan showing the exact location of these areas and what sections they are allocated to. By checking the rules you will also see if there are any special rules regarding repairs and maintenance applicable to your scheme. Have you battled with who is responsible for repairs and maintenance in your scheme? Share your story with us in the comments below! I have noticed that my units front window has very thin glass, almost as thin as picture frame glass. i am convinced that this glass is what was install when they built the complex about 30 plus years ago. My tenant now has a young child and it worries me that they could be seriously hurt going through this window. there are about 3 glass windows one large and two small, they go down to about 20 cms off the floor level. I believe the BC should pay 50% of the cost for me to replace these windows – what is your opinion ? Great question! I suggest logging into Facebook and post your question there, as we answer one question a day, for free. What is the facebook page called ? Are there structural problems in your apartments? A statutory body. By law, all home builders have to be registered with the council, and have to comply with its building quality standards. Check the website to check if your builder is registered, or whether he has been suspended or deregistered. There is also a warranty scheme in place, which covers “major structural defects” caused by poor workmanship. Noncompliance and deviation from plans and specifications is also covered. You can lodge a complaint via the council’s website. The NHBRC inspects homes – The objective of inspections is to protect housing consumers against poor workmanship during construction. In the situation where the inspector identifies a deviation from the NHBRC Home Building Manual, a non-compliance will be issued to the home builder. Estate Agency Affairs Board – did the estate agent knowingly sell your apartment with a roof which leaks? I am led to believe that should there be a problem inside a unit that is caused by a problem outside the unit ie. common property then the BC has to pay to fix the outside and well as inside the unit. A wall for example that is allowing water/dampness through into the unit causing paint to come off the walls. This outside wall must be waterproofed and then when the wall has dried out, the BC must paint the inside of the unit. Foundations sinking causing cracks and problems inside a unit likewise. 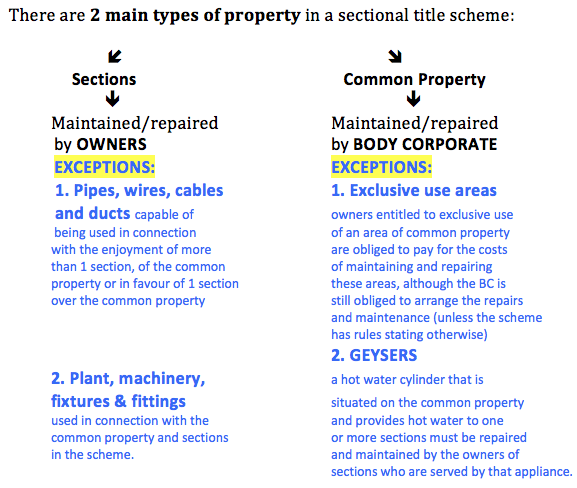 This entry was posted on September 5, 2013 by Paddocks in Financial, Legal, Meetings and tagged body corporate maintenance, common property maintenance, common property repairs, sectional title act, sectional title repairs, who pays for exclusive use area.